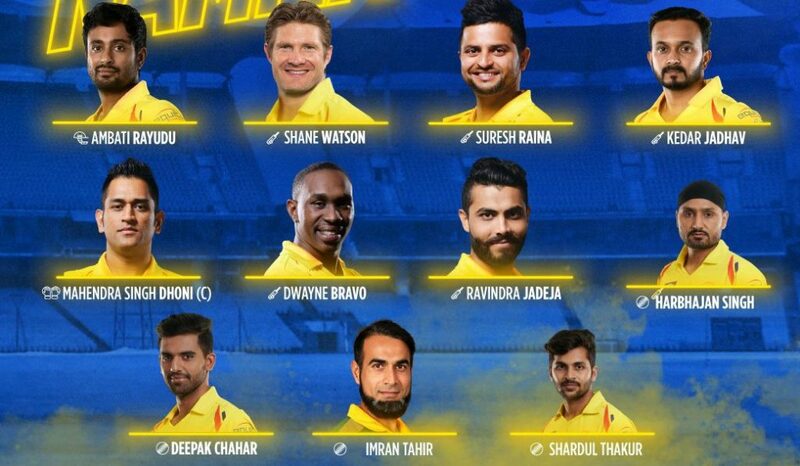 RCB opted for AB de Villiers, Shimron Hetmeyer, Moeen Ali and Colin de Grandhomme as their overseas options while Chennai, somewhat surprisingly, went with just three foreign players- the PSL winning Quetta duo of Shane Watson & Dwayne Bravo and South African spinner Tahir. CSK’s first home game last season, against KKR at this same venue, had produced over 400 runs, but skipper MS Dhoni, perhaps unsure of how the wicket would play, opted to field first after winning the toss. Dhoni’s decision was vindicated as his bowlers started off brilliantly. Deepak Chahar was miserly at one end and it forced RCB skipper Virat Kohli to attempt to target Harbhajan Singh at the other. However Kohli was only able to pull one straight to Jadeja at deep midwcket and departed after making only 6 off 12 deliveries. Moeen Ali, promoted to No 3, swept Harbhajan for a six but the off spinner had the final laugh, getting him caught and bowled after England all rounder had been deceived by the lack of pace in the wicket. AB de Villiers was given a life when compatriot Tahir dropped an easy catch in the deep, but the former South African captain failed to capitalize and was dismissed on the very next ball, with Jadeja making no mistake this time around on the mid-wicket boundary. Shimron Hetmyer appeared to have caught stage fright on debut as he was needlessly run out for a two ball duck. The West Indian hit a Harbhajan delivery straight to Suresh Raina at cover and went for a non existent single. Shivam Dube, also playing his first IPL match, failed to read Tahir’s googly and was caught by Watson at slip. Tahir also accounted for Navdeep Saini, who padded one to slip while defending, and Yuzvendra Chahal, who holed out to Harbhajan in the deep. 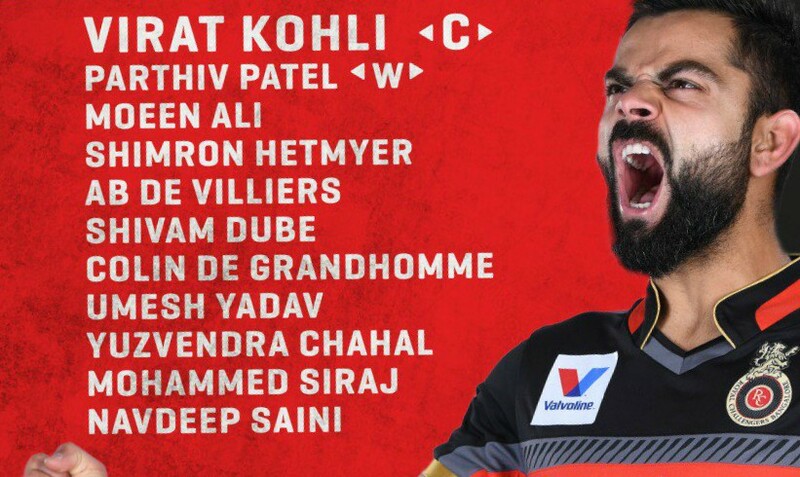 Opener Parthiv Patel was the top scorer and was the last man dismissed- the only RCB player to fall to pace, as the visitors were bundled out for just 70 runs in 17.1 overs. Apart from Patel, none of the RCB batsmen even managed to reached double figures. Harbhajan and Tahir bagged 3 wickets each, while Jadeja claimed 2. Chasing a modest total of 71, Chennai started badly as they lost Shane Watson for a ten ball duck. The duo of Ambati Rayudu and Suresh Raina then steadied the innings by adding 32 runs for the second wicket, before the latter holed out to Dube at long on. Raina, who had struck three fours off Moeen, also became the first batsman to score 5,000 IPL runs during the course of his innings. 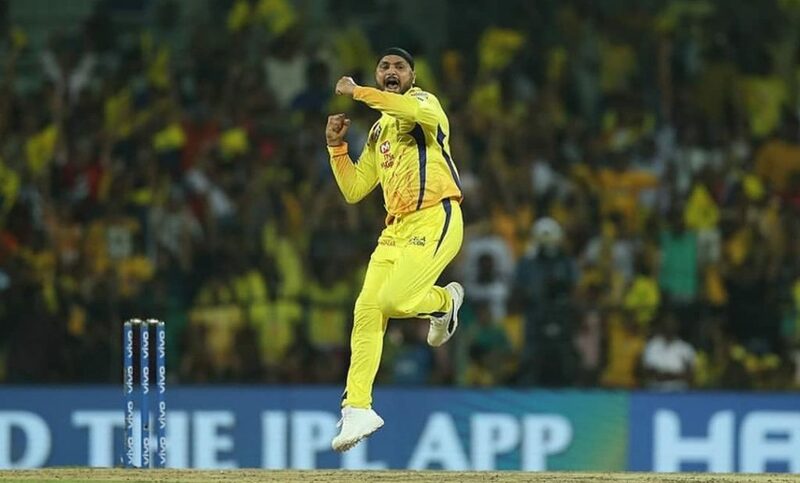 Rayudu, who had been given a reprieve when Umesh Yadav dropped a relatively straightforward catch early in the innings, top-scored for CSK with 28 runs before being bowled by Mohammed Siraj. The home side cantered to victory in the 18th over, but took more deliveries than RCB had in the first innings, illustrating the tricky nature of the pitch. Harbhajan Singh was declared the Man of the Match for his match winning spell of 3/20 upfront. The second day of the Indian Premier League will be double header with Kolkata Knight Riders taking on Sunrisers Hyderabad at Kolkata and Mumbai Indians squaring off against the Delhi Capitals at the Wankhede Stadium.